1 tablespoon of course salt or fleur de sel. Using a mortar and pestle, spice grinder or mini food processor, grind 2 tablespoons of Lapsang Souchong Black Tea leaves, salt and chili flakes (optional). We prefer our salt mix a bit course, but others may prefer a finer powder. Fill a large pot (roughly 6 cups) of drinking water and bring to a boil. Add 1 bag of frozen edamame to the boiling water and cook until the edamame is tender. This could take about 4-6 minutes. The pods will start to open a little bit. Try one and taste. When cooked, drain thoroughly and transfer to a large bowl. Toss the edamame with the salt mix. Garnish with lemon zest and serve warm. If you don’t have Lapsang Souchong Black loose leaf tea, you can substitute it with 2 tablespoons of toasted sesame seeds. 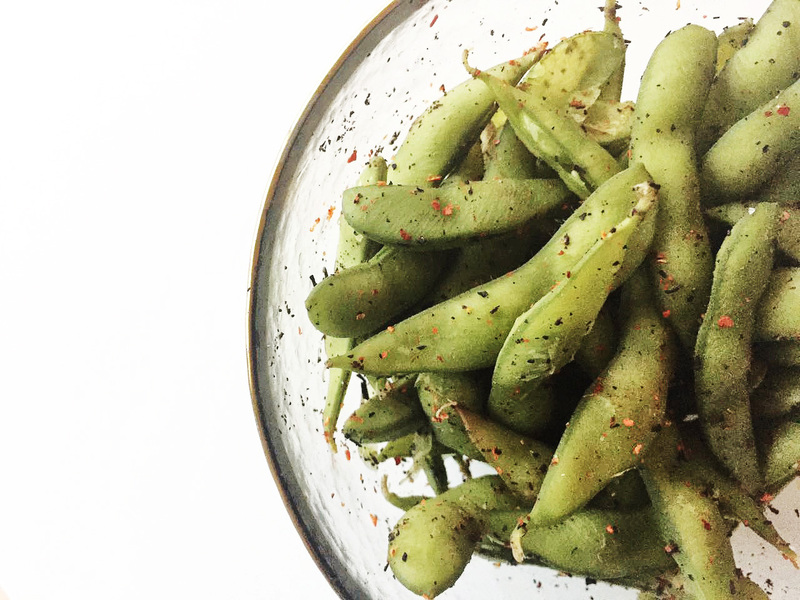 It will not give that smoky flavor, but it will still enhance the edamame with nutty flavors.